Visitors to your website can search for listings by regions, categories and key words with a search box like the one shown below. 1. You can add a region from the profile tab by clicking Add New and entering the name (internal reference to the region or category) and Title to be displayed. 2. 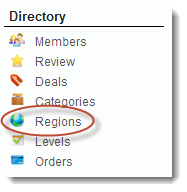 To add multiple regions, follow the path shown below and click Add New Region. You can upload an image to display with the listings in this region. Remember to SAVE each entry. After saving, you will see this menu at the top. 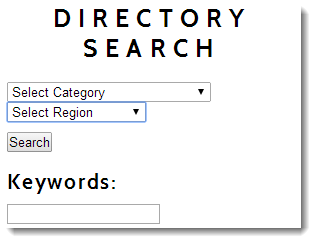 Select Regions from the directory below. You can reorder the regions by dragging the entries until they snap into place and designate broader search parameters by using the arrows on the left. Refer to the example shown below. 'Coast' is a broad geographical area and the cities 'Bandon', 'Brookings-Harbor' and 'Charleston' fall within it. By clicking on the arrows at the left, the cities are indented beneath 'Coast'. A search for the Region 'Coast' will display all of the members in cities listed beneath 'Coast'. A search for Bandon will show all members located in Bandon.